Keith Reimink films on the polar plateau. The camera box is made from insulated blue foam that holds in heat. The heat source is a lead weight that was heated in a convection oven. It allowed for hours of filming. Courtesy photo. Having seen a fair amount of Antarctic footage over the years, I was more than curious about Keith Reimink’s Film “No Horizon Any More: A Year Long Journey at the South Pole.” Reimink is a Zeeland-born born filmmaker who graduated from film school at New York University in 2002. The 77-minute documentary is his first film. He is submitting it to film festivals around the country. If you get the chance, go see it. 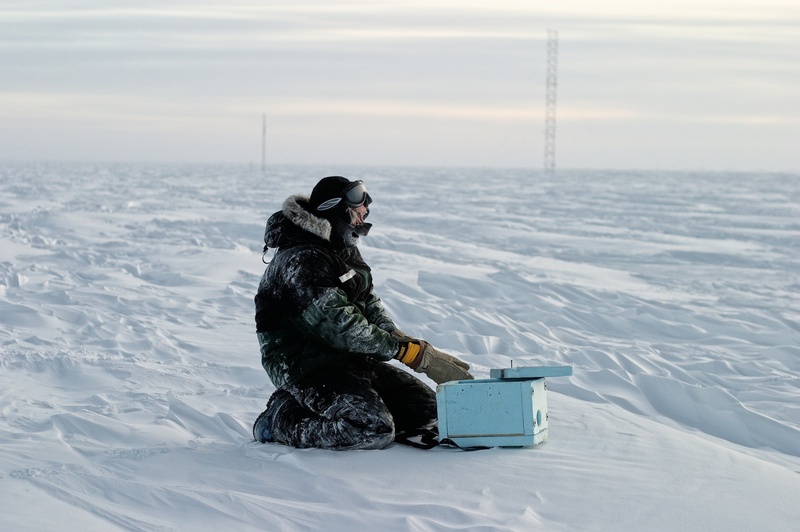 It provides a fascinating look at a different slice of life at the Pole. 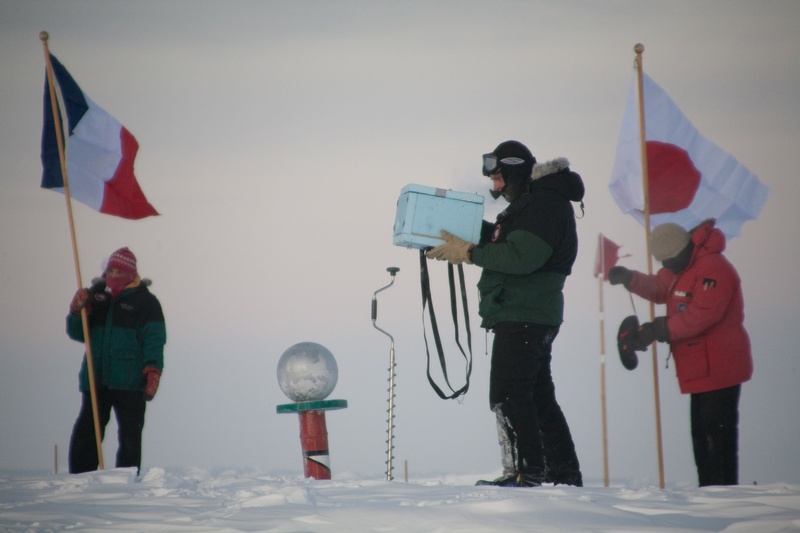 Most other South Pole films revolve around some big outdoor adventure: trekking to the South Pole, setting a new speed record, living in a tent, surviving at 90 degrees below zero, or more scientific footage and historical documentaries. Reimink’s slice of polar life focuses on the people who work there every day, those who cope with life cooped up in the Amundsen-Scott South Pole Station, a place were the sun never shines in the long, dark winter months. They are tested not only by harsh environmental conditions, but by the human-condition we all face inside ourselves when living in close proximity with others – some who we like, others that we don’t. Show that he does: warts and all. Life at the pole is not easy and tensions build. Reimink’s prosaic perspective is that of a cook for the station, where he signed on for a year. His footage was collected as he lived life at the pole. It was September when he realized he’d shot enough to develop a film. Keith Reimink films at the Flag Ceremony during sunrise. The treaty flags fly for a full year and are replaced when the sun comes up in anticipation of the summer arrivals. Courtesy photo. Along the way the way he captures the essence of being there, the majesty, the brutal conditions, the science taking place, the people who come and go, and the odd moments that workers let off steam or resort to putting golf balls in the hall. And, of course, being human. No Horizon Anymore will be shown at the Central Michigan International Film Festival at 6 p.m. on February 10 and 3:15 pm on February 16 at the Park Library Auditorium. The soundtrack features west Michigan musicians like Paucity, Ghost Heart, Expunk, Shores, Lights at Sea, Charles the Osprey, The Glowfriends and Jon Van Oss. This entry was posted in Uncategorized and tagged Amundsen-Scott South Pole Station, Antarctica, Documentary Film, Film Review, Keith Reimink, South Pole, Video Review, Zeeland. Bookmark the permalink.